Potted plants, planter boxes and garden beds are very attractive to cats. 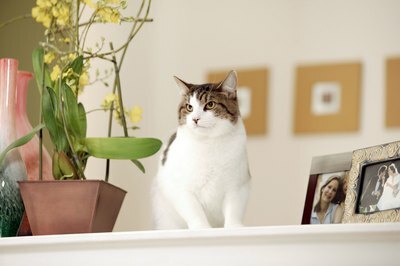 Your cat has a lovely new litter box, clean litter and lots of attention, yet she's still urinating in your planter box! If you're dealing with this negative behavior, there's no need for frustration or anger. A few simple tricks will convince kitty to stop peeing in your plants. Take your cat to your veterinarian for a complete examination to rule out medical causes for her inappropriate urination. Urinary tract infections and other problems may cause your kitty to urinate in strange places. Clean your cat's litter box and consider making litter or location changes. Large cats, for example, may be uncomfortable using a litter pan with a lid, and some cats are picky about the type of litter they use. Repot your plants or change out all the soil in your planter box. Not only will this deter your cat from urinating in the same place again, but it will give your plants a nutritional boost. Clean the entire area with an enzymatic solution to remove all traces of urine odor. If your kitty smells urine, she will keep using your planter box as a litter box. Soak the pot (if you're just changing the soil) and all surrounding areas. Fill a spray bottle with water and squirt your kitty every time she jumps up on your planter box. In most cases, a few sprays will effectively deliver your message. Add several inches of decorative rocks to the top of your soil. Both river rocks and lava rocks works well. If you kitty can't dig to cover up her urine, chances are good that she'll find another place to go. Mix some orange or lemon peels with the top layer of soil. Cats dislike citrus scents, according to Alley Cat Allies. Replace the peels weekly, and don't worry about leaving some old ones behind; they will decay on their own in the soil. Keep your cat out of your planter box by placing crinkled aluminum foil on top of the soil, placing wire mesh inside the box, or filling the space with small pine cones. All of these items are unpleasant to cats and can help save your plants. Try a cat deterrent spray. These sprays contain ingredients your furry friend won't like, and spraying them in and around your planter box may turn the area into a cat-free zone. A variety of sprays are available in pet stores; research each online before making your purchase. Alternatives to citrus peels include coffee grounds, citronella oil and eucalyptus oil. You can also try planting lavender around the base of your potted plant.